Cytokeratin 8 (CK8) belongs to the type II (or B or basic) subfamily of high molecular weight cytokeratins and exists in combination with cytokeratin 18 (CK18). CK8 is primarily found in the non-squamous epithelia and is present in majority of adenocarcinomas and ductal carcinomas. It is absent in squamous cell carcinomas. 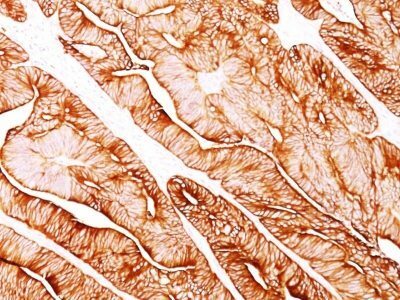 Hepatocellular carcinomas are defined by the use of antibodies that recognize only cytokeratin 8 and 18. CK8 exists on several types of normal and neoplastic epithelia, including many ductal and glandular epithelia such as colon, stomach, small intestine, trachea, and esophagus as well as in transitional epithelium. Anti-CK8 does not react with skeletal muscle or nerve cells. Epithelioid sarcoma, chordoma, and adamantinoma show strong positivity corresponding to that of simple epithelia (with antibodies against CK8, CK18 and CK19). Reportedly, anti-CK8 is useful for the differentiation of lobular (ring-like, perinuclear) from ductal (peripheral-predominant) carcinoma of the breast. 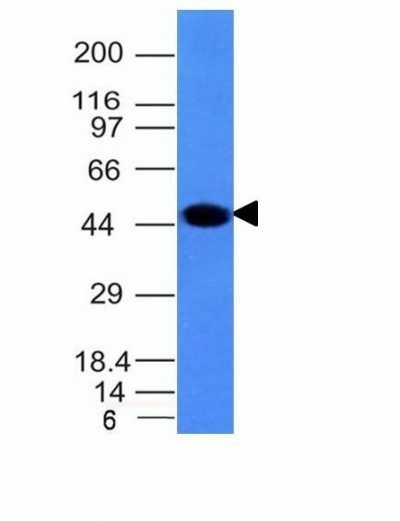 Catalog number key for antibody number 0334, Anti-Cytokeratin 8 (H1) The prefix indicates conjugation, followed by the antibody number and size suffix.